I don't quite know when the RHS knew that some of it's most constant sponsors had pulled out of the 2017 show, but there was no attempt made at reducing the ticket prices. However, it was still sold out. In theory this should have been a good year for some designers as arguably there was less competition. There was only one really big gun in the world of tv horticulture - Chris Beardshaw. But even though his was clearly the most popular garden with the public he could only garner a silver-gilt. I didn't see enough of the tv coverage to find out why but if I had to guess I would say the planting was a bit "busy". Though this is precisely what a lot of people liked about the garden - the sheer range of colour, texture and form. It was a garden of two halves, one bright and colourful, the other more textural and green. It was impossible to get a photo of the garden as a whole, mainly because the crowds here were the deepest and most constant through the whole day I was there. Best in Show went to James Basson, a designer based in the South of France. In the well-known game, I have only two degrees of separation to James Basson as he is designing the Provence garden of one of my London clients. His gardens are rarely everyone's cup of tea as they are based on Mediterranean plants put together in a sustainable way that requires very little in the way of soil improvement or irrigation. This is precisely what my client wants for her new garden, but it's not exactly traditionally "English". This garden rekindled the debate about where gardens end and wild landscapes begin. In an era of increasing awareness about sustainability in general and the effect our changing climate is having on gardens in particular this is a trend that is likely to continue and develop. 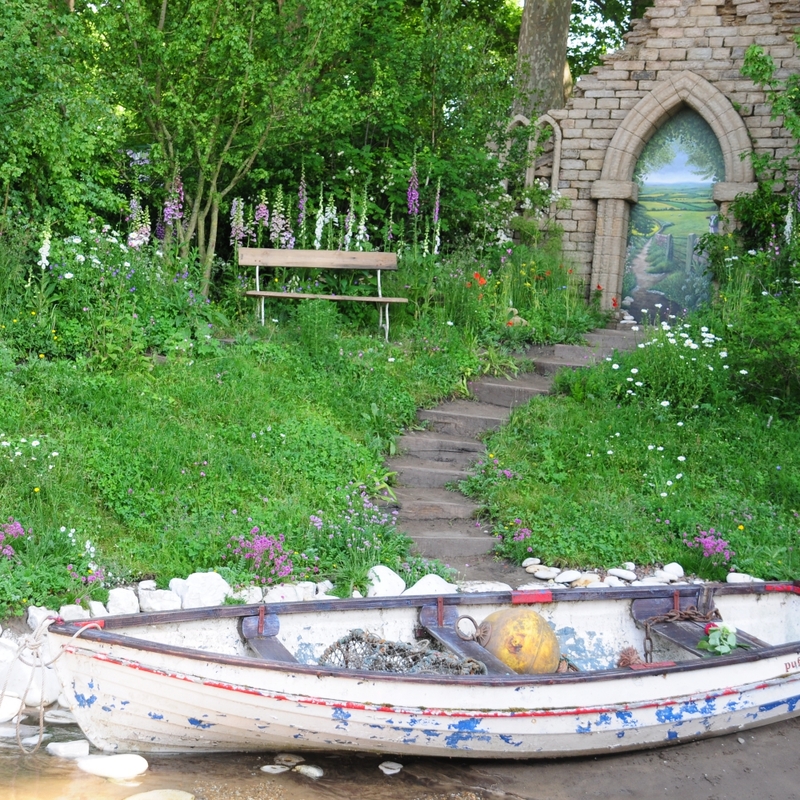 One garden that combined traditional English with a wild landscapes was the Welcome to Yorkshire garden. I've not been to the bit of the coast, Whitby, that this garden represents but I find it hard to imagine how this would survive some typical "northern" weather. I loved the boat but the mural in the folly was quite naff. 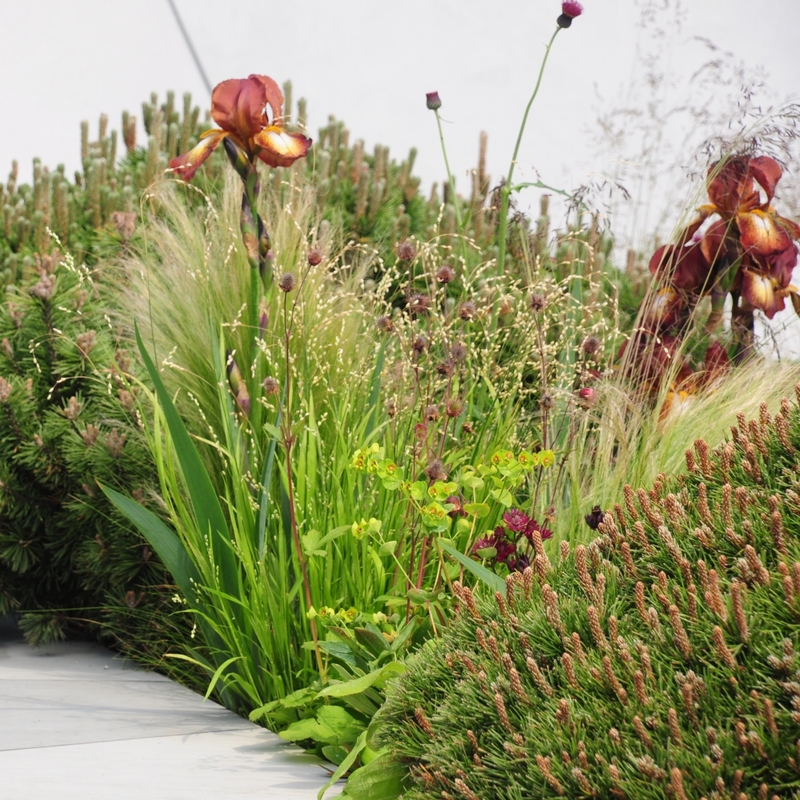 Newcomer Charlotte Harris's garden for Royal Bank of Canada was also based on an interpretation of a wild landscape. I really liked this garden (even though it was difficult to photograph) and it would be easy to imagine it sitting well in parts of Scotland that have brief but intense summers with very long days. One of the key plants in the Royal Bank of Canada garden was the Jack Pine and 2017 was surely the year of the pine in its many forms. The Radio 2 gardens were a welcome addition to the repetoire at Chelsea and helped fill some of the gaps left by fewer main show gardens. 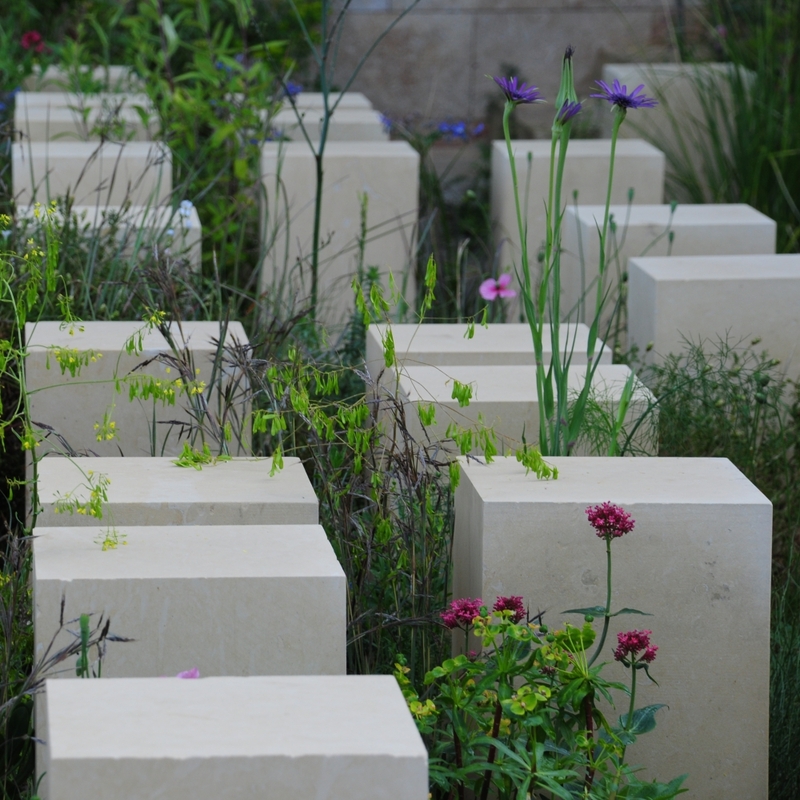 I particularly liked the Texture Garden designed by Matt Keightley. One of the most regular designers at Chelsea is Kazuyuki Ishihara. Ths was another garden that was really popular with the Chelsea visitors. It is an exercise in the minature with each detail exquisitely crafted, demanding close attention. I'm no expert on Japanese gardens other than knowing they are usually a stylised representation of nature and man's place in it. This garden was one an increased number of Artisan's gardens, demonstrating the combination of traditional skills with horticulture. i thought the overall standard of the Artisan gardens was higher than usual and some of them were entertaining. Some of my favourites included Dr Catherine MacDonald's garden for Seedlip. The copper piping weaving through the planting was fun. 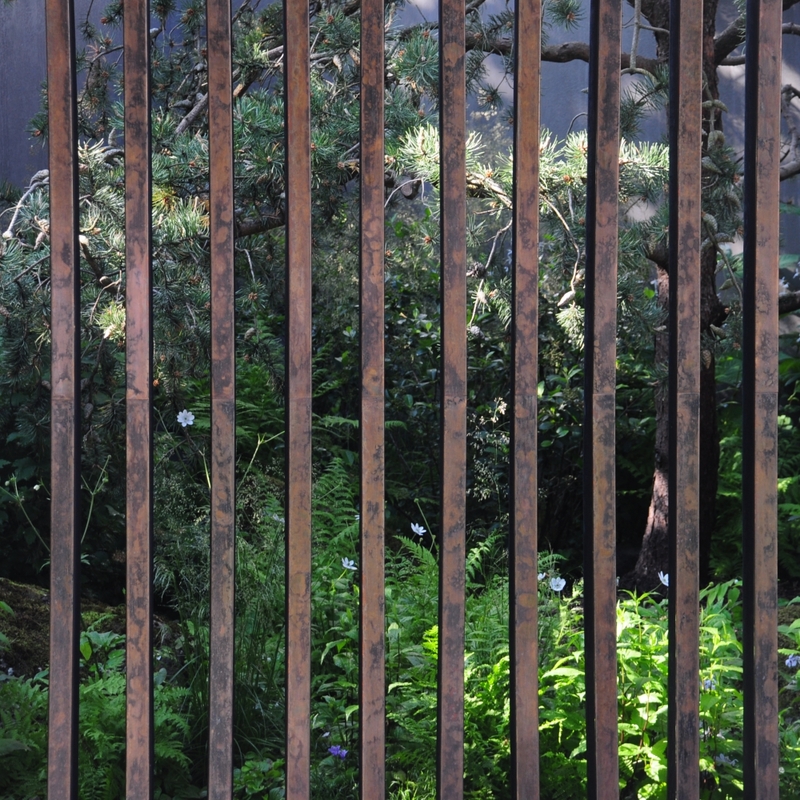 The metal work continued into Graham Bodle's reclammation of an industrial site into a garden. I love a bit of rusty metal... and look, more pines. 'm normally a big fan of Sarah Eberle, a former winner of Best in Show. This Viking Cruises garden didn't do much for me but I did like some of the plants, particularly this cactus. For my final garden there is only one degree of separation. The Breaking Ground garden was designed by Andrew Wilson and Gavin McWilliam; Andrew was my tutor when I studied garden design. The duo finally won a gold medal with this garden after several near misses (somewhat painful for Andrew who is a former head judge at Chelsea). It just shows what you can do with a lot of experience, a loyal sponsor, determination and ambition. And, what is that tree in the background?